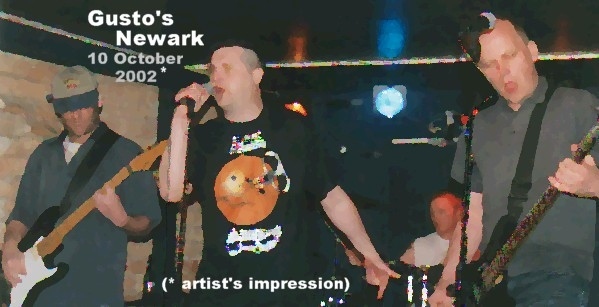 In years to come, unofficial photographs (and illicit bootleg CD recordings) of Pointy Boss's October 2002 Newark gig are likely to become some of the most collectable band memorabilia being traded on e-bay. No official photographs of the band's thirteenth gig exist  the one and only time that this has happened! To add to the air of mystery, band sources declined to comment further on the gig  but did thank promoter Micky for his hard work putting the night together, and the moshers in the audience who 'went for it' during the first few numbers of the set. Were you at the gig  and have you got the pictures, or MP3s, to prove it? Let us know, here.